This page is in the process of being translated into Chinese (Traditional). If you can speak Chinese (Traditional), post on the talk page or speak to those who have contributed to the page (by viewing the page history). Wheatley is first seen early in the game by Chell, attached to a rail on the ceiling. After detaching himself from the rail, he accompanies Chell on a route through the ruined Enrichment Center chambers, using his compatibility with the Center's systems to allow passage through shortcuts. Eventually, they come to GLaDOS' ruined chamber, where she promptly awakens and appears to destroy Wheatley. However, he survives and meets up with Chell later on. During the course of the game, Wheatley aids Chell into escaping from GLaDOS' tests. The two eventually sabotage GLaDOS' turret production line and neurotoxin and later confront GLaDOS herself. A core transference occurs and Wheatley takes over the facility. When he is about to let Chell escape, Wheatley becomes corrupted with power and becomes the game's new main antagonist. Wheatley reconstructs GLaDOS' hardware on to a potato battery and knocks both her and Chell into Aperture Science's old and forgotten test chambers by accident. After returning from the old test chambers, Chell and GLaDOS learn that Wheatley's actions are causing the facility's reactor to approach a nuclear meltdown. After passing through more test chambers made by Wheatley, he attempts to kill Chell and GLaDOS. After escaping his traps, GLaDOS suggests causing a new core transfer by implanting corrupt Personality Cores into Wheatley. Chell enters Wheatley's lair to begin the final confrontation of the game. By shutting him down temporarily with bombs, Chell corrupts Wheatley enough to initiate a new core transference, saving the facility from destruction in the progress. However, a stalemate occurs when Wheatley does not agree to transfer himself, and Chell must press the stalemate resolution button to finalize the transfer. However, Wheatley had booby trapped it with explosives, and Chell is flung from the button. Chell survives and launches a portal onto the surface of the Moon, causing both her and Wheatley to be sucked into space. GLaDOS then reacquires her old body and rescues Chell while letting Wheatley be launched into the vacuum of space. Wheatley is last seen in the epilogue after the end credits, with the Space Core orbiting him, where he wishes he could say he was sorry for all he did to Chell. Wheatley, as he appeared in the E3 2010 trailer. Wheatley attached to his rail. Wheatley after taking control of the facility. Wheatley in a dirty state, after being crushed by GLaDOS (but somehow surviving.) Note what appears to be a cracked lens on his eye. Wheatley image from the official Aperture Science Collaborative Disposition Test. Wheatley Valentine from Valve's official Portal 2 blog. Wheatley compared in size to Chell. 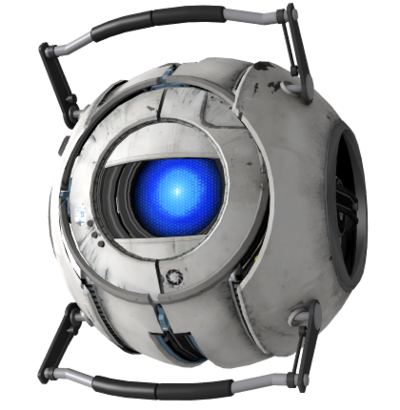 Wheatley icon from the official Steam Portal 2 group. Appearance-wise, Wheatley appears to be an upgraded version of GLaDOS' Intelligence Core (the one telling the cake recipe), with a blue "eye" and three dots, though Wheatley has dots only on his right side. From early screenshots and the Portal 2 E3 teaser trailer, the model also appears to have been greatly improved and more detailed, with a wider range of emotions. Wheatley's Cockney accent heard in the Meet Wheatley (video) video shown at E3 2010 uses a placeholder voice provided by Valve animator Richard Lord. Due to very positive feedback, Valve considered at some point making the voice official. Later Lord himself emphasized that his voice was temporary, saying that "theres no way you will be dissapointed with the final voice - i'm over the moon with who it might be." [sic], until it was announced that Stephen Merchant would provide the final voice. This page was last modified on 29 August 2011, at 10:44.